Intriguing, refreshing, delicious pomegranate juice is all-natural. To ensure that you get the most wholesome product possible, we only use fresh juice. We do not add any preservatives or additives, nor do we apply any heat treatment (pasteurizing). Pomegranate juice is one of nature’s most powerful antioxidants – molecules that protect the body from the harm done by free radicals that cause heart disease, premature ageing, Alzheimer’s disease and cancer. Antioxidants also reduces the risk of arteriosclerosis – a condition that leads to the thickening and hardening of arterial walls. It also helps to raise the levels of “good” (HDL) cholesterol, while reducing the uptake of oxidized “bad” (LDL) cholesterol . The antioxidant properties in pomegranates are three times more powerful than those found in red wine or green tea and higher than those found in blueberry, cranberry and orange juices. The pomegranate is one of only 6 plant species that contains the fatty acid CLA – a natural and very powerful anti-cancer agents Pomegranate contains estron – a natural estrogen also produced by the human body. The likelihood of menopausal symptoms and the need for hormone replacement therapy may be reduced when pomegranates are consumed regularly. Pomegranate juice also has antiseptic and disinfectant properties. 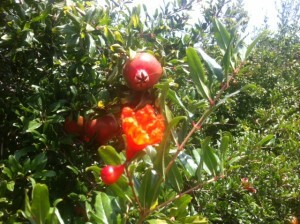 Five varieties of pomegranate fruit are pressed throughout the season and used to produce Pont Pomegranate juice. This fact may cause a slight variation in taste amongst various batches pressed.